Монголын Нууц Товчоо амралт, аялал жуулчлалын цогцолбор нь Монголчуудын үндэсний баяр болох Цагаан сар-ын баярыг 2008 оноос хойш амжилттай зохион байгуулж ирсэн. Тус евент нь жуулчдад зориулсан арга хэмжээг жил бүрийн билгийн тооллын битүүн, шинийн нэгний өдөр зохион байгуулдаг. Энэхүү баярыг орон нутгийн иргэдэд тулгуурлан, тэдний нүүдлийн ахуй амьдралыг жуулчдад болон Монгол улсад суугаа гадаадын иргэдэд уламжлалт зан заншлаа бодит байдлаар танилцуулснаар, Монголд өвлийн аялал жуулчлалыг хөгжүүлэхэд тодорхой хувь нэмэр оруулж байгаа юм. Монгол наадам, Монгол Цагаан сар бол хаана ч байхгүй дахин давтагдахгүй өвөрмөц ёс заншил, хүндэтгэл, эв нэгдлийн баяр байдаг. Ямар ч жуулчин алмайрч ангайхаар л “үйл явдалтай” билээ. Шинийн нэгний өглөө мөр гаргах, тохой өргөн мэндлэх, хөөрөг зөрүүлэн мэнд мэдэх, идээ унд хүртэх ёс, бэлэг түгээх ба хүртэх гээд дэлхийн өөр хаана ч байхгүй ёс заншлаа эвент хөтөлбөр болгон гадаадын зочин гийчдэд танилцуулдаг арга хэмжээнд жуулчдаас гадна өөрийн байгууллагын гадаад мэргэжилтэн, гадаад зочин найз нөхдөө оролцуулбал их сонирхолтой юм. Бөөгийн шашны тухай сонирхолтой тайлбар сонсонгоо Тэв тэнгэр бөөгийн хөшөө, урц сонирхох. Цагаан сарын идээний таваг засалцаж, битүүлэх ёс заншилд оролцох. It is a centuries-old celebration and one steeped in the Buddhist religion, though most Mongolians of all beliefs observe the day in some fashion. The main celebrations last for three days, from the day before to the day after the new moon, but some keep up the festivities for as long as two weeks. Tsagaan Sar comes in January or February, the date varying from year to year. The reason for this is that Mongolia uses a combination solar-lunar calendar, which keeps Tsagaan Sar firmly in mid-winter. In “Mongolian New Year’s Eve”, there are a number of rituals that Mongolians perform in order to bring good luck for the year to come. First, houses must be cleaned out thoroughly, which is often a day-long task. Candles are lit to symbolize enlightenment and to give light to any spirits who have “become Buddha” that might visit. Three chunks of ice are also left just outside the door, since the horse of Palden Lhamo, a Buddhist deity, visits every home on New Year’s Eve and will be thirsty. Finally, a family dinner is enjoyed in the evening, card games are played in the hopes of beginning a year-long good luck streak, debts are paid off, and grudges are forgiven. On Lunar New Year itself, people visit their relatives, beginning with their parents and continuing in order of descending age. They make many short visits to dozens of relatives. Each time, special rituals are followed. The guests must ask the hostess, “Are you living in Peace?” The hostess kisses the guest’s cheeks, gives out a gift of money or vodka, and serves milk tea. Gifts may also be exchanged. Watch Mongolian wrestling competitions on TV, like many Mongolians do in their New Year’s Eve. In Mongolian folk wrestling, called “bukh,” the first person whose body touches the ground, other than the foot, loses. From the days of Chinggis khaan, wrestling of this sort has been an integral part of Mongolian culture. Eat “Lunar New Year food,” including: “buuz” – a steamed dumpling – special cookies that are stacked in a pyramid, rice mixed with curds or raisins, sheep’s tail, horse meat, pastries filled with minced mutton, and a full side of sheep on the grill. Buy and dress up in traditional nomadic clothes, called “deel,” which almost everyone wears this time of year. It is a large coat that overlaps in front to reach buttons on your shoulder and your side. Colourful designs are stitched on, and a long cloth belt is used. It is also customary to wear a fur hat and leather boots with curly toes with your deel. 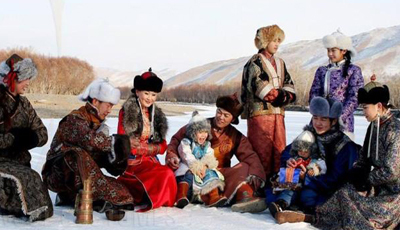 Lunar New Year is a time when Mongolians celebrate in the midst of a cold, long winter, looking forward to the spring. It is also a time when tourists learn and enjoy many interesting facets of Mongolian culture. Visit to the statue of Shaman, “Tev Tenger”, listen stories about the fascinating customs of ancient shamanism and enter to the urts, shaman wigwam. Visit a true nomadic, local herder’s family and help, experience in preparing traditional food buuz, bansh (Mongolian dumplings) which are Bituun’s main meal. Before sunrise you will walk your first steps of the New Year as prescribed by Mongolian traditional beliefs. Each person has a different ritual to perform depending on their birth year and month. We hope that you enjoy our Lunar New Year!